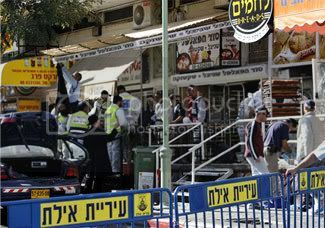 Israeli forensic police officers look for evidence and ZAKA volunteers prepare to collect body parts at the scene of a suicide attack which ripped through a bakery in the southern Israeli resort of Eilat, Jan. 29. TEL AVIV, Jan. 29 (JTA) — Eilat generally has escaped the violence of the six-year Palestinian intifada, but even its remote setting couldn’t forever insulate the Red Sea resort city from the region’s tensions. A suicide bomber struck Monday morning at a small bakery in the usually serene city, killing three people when he detonated his explosives belt in a residential area. It was the first suicide bombing in Israel’s southernmost city, built on the edge of the Red Sea with views of Jordan and Egypt. “It was awful — there was smoke, pieces of flesh all over the place,” Benny Mazgini, 45, who ran to the bakery from a building across the street, told Israel Radio. The scene was a foreign one in Eilat, whose luxury hotels, restaurants and nightclubs have made it popular with foreign tourists and Israelis. Israeli officials said the bomber was believed to have entered Eilat from Egypt and warned that accomplices might still be at large. Defense Minister Amir Peretz called Monday for an end to Israel’s policy of restraint against Palestinian terror organizations. Peretz ordered the Israel Defense Forces to prepare to launch operations inside the Gaza Strip and against the infrastructure that enabled the Eilat suicide bomber to cross from Gaza into Israel. “We will not make any discounts for terror groups, and the cease-fire will not prevent us from targeting them,” Peretz said following a security assessment with senior defense officials, including outgoing IDF chief of General Staff Lt.-Gen. Dan Halutz. Despite Peretz’s harsh response, however, defense officials estimated that the IDF would not launch any major operations in response to the Eilat attack, the Jerusalem Post reported. The suicide bombing came after a relatively long stretch of calm inside Israel, and was the first such successful attack in nine months. Other attempted attacks have been foiled by Israeli security forces. Prime Minister Ehud Olmert said in a Kadima faction meeting that for “a long time, Israel [had] enjoyed the illusion of quiet.” Olmert stressed that in recent months, Israel had prevented numerous terror attacks. The prime minster extended his condolences to the victims’ families and said that he had spoken with Halevi. “I believe Eilat will overcome this blow and remain a happy city,” Olmert said. Eilat promotes itself as a resort city where tourists weary of winter can find comfort in sunny skies, sailing, snorkeling and scuba diving, and jeep and horse trips into the surrounding desert mountains. Among the most worried in Eilat are those who work in its tourism industry, the basis of the city’s livelihood. Eilat was just beginning to recover from the wave of tourist cancellations that followed Israel’s war with Lebanon last summer, but some fear the attack could again scare off foreigners. Miri Eisin, Olmert’s spokeswoman to the foreign press, tried to assuage fears. Several Palestinian groups claimed responsibility for the bombing, but Islamic Jihad said the bomber was Mohammed Faisal al-Saqsaq, 21, from Gaza City. Fatah officials condemned the attack, saying they were against any violence against civilians, even though the Al-Aksa Brigades, Fatah’s terrorist arm, was one of the groups claiming responsibility. Officials from the Palestinian Authority’s ruling Hamas movement, meanwhile, welcomed the bombing and said Israel had brought such attacks upon itself because of its policies in the West Bank and Gaza. Although peaceful by Israeli standards, the Eilat area has seen at least one other terror attack. In November 2003, a Jordanian armed with a Kalashnikov rifle crossed the border near Eilat and opened fire on a group of Christian pilgrims from Ecuador, killing one woman and injuring five others. Al-Qaida claimed responsibility at the time. Israeli media reported that about six months ago, the Cabinet was informed by security officials that Egypt was observing an al-Qaida network operating in the Sinai desert. Several attacks in recent years have targeted Israelis and other foreigners along Sinai’s beaches.